Enjoyed on the first floor of the castle in either the magnificent Queen's Room, with its barrel-vaulted ceiling dating back to the 12th century and open fire or The Great Room, built in 1165 by Bishop Luffa of Chichester, a fine example of Norman architecture with its high lancet windows, open fireplace, oak flooring, tapestry and suits of armour. The dress code for the dining room is smart casual, with no jeans or trainers. Please note, we welcome well behaved children aged 8 years and over to dine in the restaurant. For children under the age of 8, please contact the team and we will find a private dining room at no extra cost. 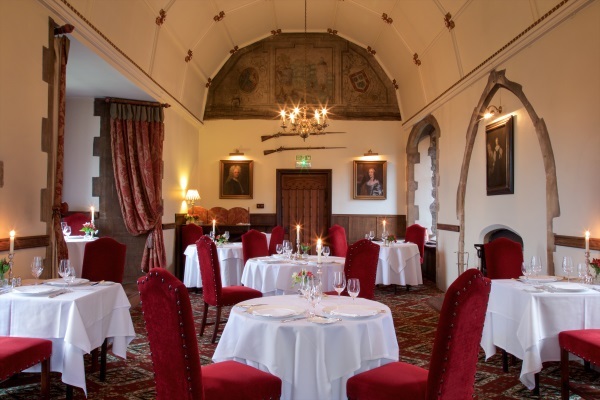 Treat someone special to a memorable dining experience at Amberley Castle with one of our dining & drinking gift vouchers.